It's been 2 1/2 years since we first watched Kung Fu Panda at the theater. I can remember the day (I even did a post on it here). It was Labor Day Weekend and we headed to a local dollar saver theater to see Kung Fu Panda. The four of us all got into the movie for only $2 that day. I remember my son enjoying the movie (he asked if there was a Kung Fu Panda 2, after seeing the movie) and my daughter, who was about 21 months old, falling asleep near the end of the movie. It took a few years, but soon I can tell my son that yes there is a Kung Fu Panda 2 because later this spring, Kung Fu Panda will be back on the big screen, with the release of DreamWorks' Kung Fu Panda 2. "Kung Fu Panda is back! 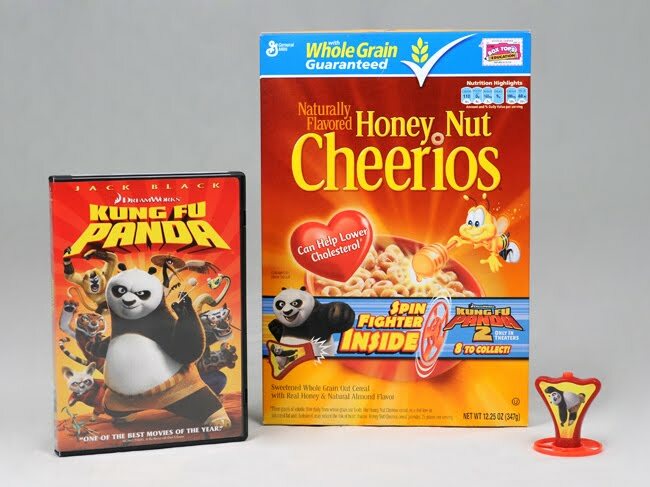 General Mills is teaming up with DreamWorks’ Kung Fu Panda 2 to bring the action-packed adventures right to your breakfast table. 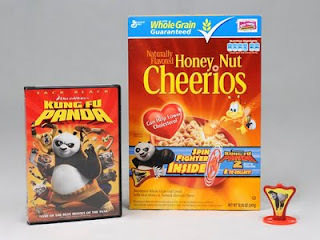 Throughout the spring, spin fighter toys featuring Kung Fu Panda 2 characters including Po, Tigress, Shifu, Monkey, Lord Shen, Mantis, Crane and Viper can be found inside specially marked boxes of participating General Mills cereals: Cocoa Puffs® (11.8 oz. ), Trix® (10.7 oz. ), Golden Grahams® (12 oz. ), Reese’s Puffs® (13 oz. ), Cheerios® (14 oz. ), Apple Cinnamon Cheerios® (12.9 oz. ), Cookie Crisp® (11.25 oz. ), Lucky Charms® (11.5 oz. ), Cinnamon Toast Crunch (12.8 oz.) and Honey Nut Cheerios (12.25 oz.). Let the games begin with one spin fighter toy in each box. Simply cut out the targets on the box and then use your spin fighter to try and knock them down. With eight character toys to collect, the Kung Fu fun can continue all summer long!" One A Busy Mom of Two will win a Kung Fu Panda 2 prize pack which includes one box of a participating Big G cereal, a Kung Fu Panda 2 spin fighter toy and the original Kung Fu Panda movie. To enter: Leave a comment sharing which Kung Fu Panda character is your child's (or your) favorite. Tweet about this giveaway. You can use: " I just entered to win a Kung Fu Panda 2 Prize Pack from @ABusyMomofTwo http://bit.ly/mJi2y3 #myblogspark " This can be once daily, please be sure to leave a link to the tweet in your comment. Share this giveaway link on a giveaway link up and leave a comment with a link back to the link up. Giveaway will remain open until June 2nd at 6pm and is open to US residents. Winner will be selected using Random.org random number generator. The winner will be contacted by e-mail (Please make sure that your email address is either in your comment or clearly visible on your profile or blog) and will have 48 hours to respond or a new winner may be selected. No compensation was received for this post. I received a Kung Fu Panda 2 Prize Pack through MyBlogSpark. All opinions expressed are completely my own. We love Poe the best. We have never seen Kung Fu Panda so we don't have a favorite. You are at the top of my blogroll! I know what you mean, however I myself and barely watch these types of movies because the memories just start to overwelem me...Precious is another wonderful movie (everyone told me it was wonderful anyway) that I couldnt watch for more that a few minutes.download Kung Fu Panda 2 movie from here with is deal with same stuff. Is it ok to say we don't have a favorite b/c we haven't seen this movie (why I really need to win!!). It's been on our list to watch sometime but haven't gotten to it yet. Toy story,kung fu panda, and monsters inc. We love disney and Pixar Movies! My kids really like all the characters... they watched the original Kung Fu Panda just the other night. However, the Panda is the favorite(I can't remember name). We like Po. He is SO funny. Our fave is the Panda. Po is the all time favorite! My kids like the panda - I don't remember his name.